From discovering our fascinating heritage to relaxing with friends at a restaurant or bar, there are countless ways to experience Peterborough’s energy and culture. Whether you decide to explore our historic and cosmopolitan city through food, music, heritage or retail, you’ll be pleased with what you find. 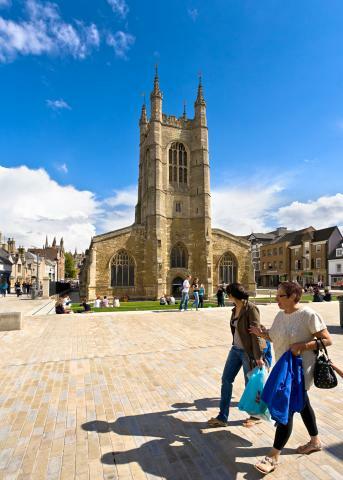 Peterborough is a medieval city with a cosmopolitan population of 183,600 people. It’s a city focused on investment, growth, connectivity and opportunity, and has an increasing reputation as the city of choice for major global players, SMEs and innovative start-up companies. With access to London in 45 minutes and direct, fast trains to the north of the country, Peterborough boasts excellent transport links, world-class internet connectivity and exciting plans for growth. Peterborough is one of the UK’s 4 future city demonstrators and home to the country’s largest cluster of environmental businesses. Through our smart city programme we’re changing the way our urban systems work and creating the UK’s environment capital. Peterborough is a medieval city with a rich heritage. The splendours of our fine Medieval Cathedral, the Bronze Age settlement of Flag Fen and the Elizabethan grandeur of Burghley House are well known to residents and visitors, but there’s plenty of hidden heritage to unearth at our refurbished museum too. The city hosts a year-round events calendar which draws huge crowds - the annual Arts, Heritage and Willow Music Festivals are just a taste of the fantastic free entertainment on offer in Peterborough. Situated by the River Nene, the Key Theatre is the perfect choice for a cultural fix and offers a range of shows including dance, live bands and community arts productions. The Embankment, a vast green space nearby, regularly attracts concerts, arts and comedy festivals, as well as the UK’s largest beer festival outside of London! Playing host to a diverse mix of live entertainment including music, theatre and comedy - with the likes of Al Murray and Jimmy Carr gracing its stage - the Cresset theatre offers great choice too. Peterborough’s award-winning Queensgate Centre has over 90 stores, including John Lewis, Superdry, Primark and Fat face, and is complemented by independent boutique outlets in the adjoining Westgate Arcade. There are also regular specialist farmers’ markets and a longstanding covered market located in the heart of the city which has seen a recent surge in new street food outlets serving up a range of tasty treats. Retail offerings outside the city include Peterborough Garden Park, which was awarded the best out of town retail development in 2011 by the British Council of Shopping Centres (BCSC) and the Brotherhood Retail Park. Both boast a wide range of top brand stores. Serpentine Green, located in the Hampton Township to the south of Peterborough, widens the retail choice further with stores including H&M, Outfit and a 90,000 sq ft Tesco’s Extra, the UK’s largest when it was built. After a day of study what better way to blow off steam than to enjoy the city’s vast sporting and leisure offer? Peterborough has a fantastic choice of indoor and outdoor facilities and sports events: from swimming, horse riding, ice skating and ten-pin bowling, to running, indoor climbing, tennis, and martial arts – there’s plenty of choice to keep you active in Peterborough. Or, let the professionals do the hard work while you cheer on our local teams at a League One football match, a Premier League speedway game and a Premier League ice hockey clash! Peterborough boasts an abundance of beautiful open space. With 2,000 acres of park land, stretching out for 11 km from the city centre, Nene Park is easily accessible and a great place to burn off some energy. Whether it’s water sports, cycling or golf that you prefer, there’s plenty to keep you and your friends busy. Located less than three miles outside of the city centre, it’s well linked to Peterborough, its surrounding countryside and villages. The wonderful open countryside of the Fens and ‘John Clare Country’, and beautiful parks around the city, provide natural open spaces to explore too. Central Park, a Victorian creation just a 10 minute walk from the city centre and a stone’s throw from University Centre Peterborough’s campus, offers tennis courts and a beautifully maintained, peaceful park. Peterborough boasts a selection of stylish bars, clubs and local pubs all right in the heart of the city centre, creating the perfect environment for a great night out. Whether you like Italian, Indian, Thai or gastro pub dining, finding something to suit your palate won’t be difficult in Peterborough. As well as major operators like Pizza Express, Bill’s and Nando’s, we also have great high-quality independent restaurants such as The Banyan Tree, The Beehive and British fine-dining experience, Clarkes. Contact us to find out more about what studying in Peterborough has to offer.